The power allocation problem for multiuser wireless networks is considered under the assumption of amplify-and-forward cooperative diversity. Specifically, optimal centralized and distributed power allocation strategies with and without minimum rate requirements are proposed. We make the following contributions. First, power allocation strategies are developed to maximize either (i) the minimum rate among all users or (ii) the weighted-sum of rates. These two strategies achieve different throughput and fairness tradeoffs which can be chosen by network operators depending on their offering services. Second, the distributed implementation of the weighted-sum of rates maximization-based power allocation is proposed. Third, we consider the case when the requesting users have minimum rate requirements, which may not be all satisfied due to the limited-power relays. Consequently, admission control is needed to select the number of users for further optimal power allocation. As such a joint optimal admission control and power allocation problem is combinatorially hard, a heuristic-based suboptimal algorithm with significantly reduced complexity and remarkably good performance is developed. Numerical results demonstrate the effectiveness of the proposed approaches and reveal interesting throughput-fairness tradeoff in resource allocation. Recently, a new form of diversity, namely, cooperative diversity, has been introduced to enhance the performance of wireless networks [1, 2]. It has been noticed that besides smart cooperative diversity protocol engineering, efficient radio resource management also has profound impacts on performance of wireless networks in general and relay networks in particular . Consequently, there are numerous works on radio resource (such as time, power, and bandwidth) allocation to improve performance of relay networks (e.g., see [4–8] and references therein). However, a single user scenario is typically considered in these existing works which neglects and simplifies many important network-wide aspects of cooperative diversity. 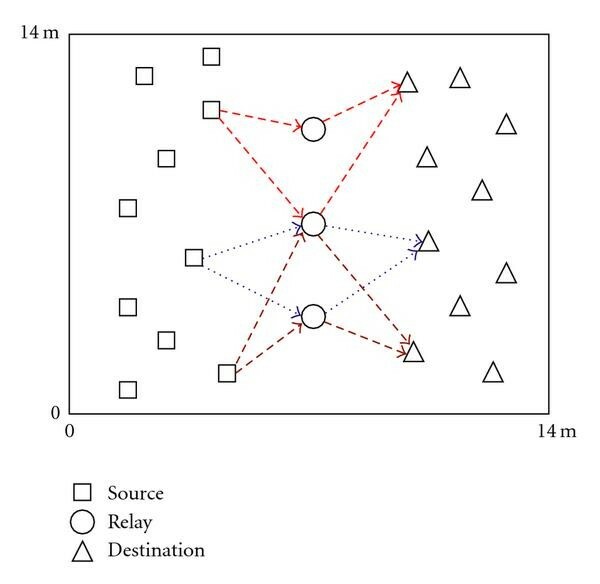 In this paper, we consider a more general and practical network model, in which multiple sources and destination pairs share radio resources from a set of relays. Note that a preliminary version of a portion of this work has been appeared in . Although various relay models have been studied, the simple two-hop relay model has attracted extensive research attention [2–6, 10]. It is also assumed in this work. In particular, each relay is delegated to assist one or more users, especially when the number of relays is (much) smaller than the number of users. A typical example of such scenarios is the deployment of few relays in a cellular network for both uplink and downlink transmissions. In such scenarios, it is clear that the aforementioned resource allocation schemes for single-user relay network cannot be directly applied. Resource allocation in a multiuser system should provide a certain degree of fairness for different users. Depending on underlying wireless applications, one fairness criterion is more suitable than the others. Studying the tradeoff between fairness and network performance (e.g., network throughput) for multiuser relay networks is an interesting but challenging problem, and thus, deserves more investigation. This paper considers resource allocation problems for multiuser relay networks under two different scenarios. Particularly, we first consider applications in which users do not have minimum rate requirements. This scenario is applicable for wireless networks which offer best-effort services. Under the assumption that the channel state information (CSI) of wireless links is available, we derive optimal power allocation schemes to maximize either (i) the minimum rate of all users (max-min fairness); or (ii) the weighted-sum of rates (weighted-sum fairness). We show that the corresponding optimization problems are convex; therefore, their optimal power allocation solutions can be efficiently obtained using standard convex programming algorithms. Numerical results show that the max-min fairness provides a significant performance improvement for the worst user(s) at the cost of a loss in network throughout, while the weighted-sum fairness provides larger network throughput. In addition, by changing the weights of different users, we can differentiate users' throughput performance which would be useful in provisioning wireless networks with nonhomogeneous services. In general, these formulations provide different tradeoffs between the network throughput and fairness which can be chosen by network operators depending on their offering services. Centralized implementation of power allocation schemes requires a central controller to collect CSI of all wireless links in order to find an optimal solution and distribute the solution to the corresponding wireless nodes. This would incur large communications overhead and render the power allocation problem difficult for online implementation. To resolve this problem, we propose distributed implementation for the power allocation which requires each user to collect CSI only from its immediate neighbors. Such distributed algorithm requires corresponding pricing information to be transferred from relays to destination nodes and requested power levels to be transferred in the reversed direction. An iterative algorithm, which implements this strategy, should converge to an optimal solution which must be the same as that obtained by centralized implementation. The proposed distributed algorithm can be used in infrastructureless wireless networks such as sensor and ad hoc networks. In addition, we also consider applications in which users have minimum rate requirements to maintain their QoS guarantees. Such applications include networks which must provide QoS and/or real-time services such as voice and video. Due to limitation of power resource, minimum rate requirements for all users may not be satisfied simultaneously. This motivates the investigation of admission control where users are not automatically admitted into the network. Such the joint technique for another application to multiuser downlink beamforming and admission control has been first developed in . In particular, we propose an algorithm to solve the joint admission control and power allocation problem. Such algorithm first aims at maximizing the number of users that can be admitted while meeting their minimum rate requirements. Then, optimal power allocation is performed for the admitted users. We show that this 2-stage optimization problem can be equivalently reformulated as a single-stage problem which assists us in developing a heuristic-based approach to efficiently solve the underlying joint admission control and power allocation problem. Through numerical analysis, we observe that the power required by the heuristic algorithm is only slightly larger than that required by the optimal solution using exhaustive search. However, the complexity in terms of running time of the former is much lower than that of the latter. Since such heuristic-based approach uses convex optimization, the joint admission control and power allocation problem can be solved efficiently even for large networks. Note that although this paper considers similar problems as in [12, 13], it is significantly different from [12, 13], especially in the system implementation and modeling. In terms of mathematical methods, the approach used in this paper is based on general convex optimization while that in [12, 13] was based on geometric programming. Specifically, it was assumed in [12, 13] that each user is relayed by one relay. This current research considers a more general scenario where one user is assisted by several relays and focuses on efficient power allocation to the relays. Moreover, while this work assumes that one source transmit power is independent of the others, sources were assumed to share their power resource in [12, 13]. Another new contribution in this paper is the development of a distributed power allocation algorithm. In addition, although the admission control concept is similar in both previous and current works, a new heuristic algorithm is derived by relaxing the binary variables, and user is dropped if it has largest gap between its achievable rate and target rate. In , no such binary relaxation was required and user was dropped because it required the most power. The rest of this paper is organized as follows. In Section 2, a multiuser wireless relay model with multiple relays is presented. Two power allocation problems are discussed in Section 3, and their centralized implementation is developed. Section 4 presents a distributed algorithm to implement the power allocation scheme presented in Section 3. The optimal joint admission control and power allocation problem and its solution are presented in Section 5. Numerical results are given in Section 6, followed by the conclusion in Section 7. Consider a multiuser relay network where source nodes transmit data to their corresponding destination nodes . There are relay nodes which are employed to assist transmissions from source to destination nodes. The set of relays assisting the transmission of is denoted by . The set of sources using the relay is denoted by , that is, . In other words, one particular relay can forward data for several users. Amply-and-forward (AF) cooperative diversity is assumed. Orthogonal transmissions are used for simultaneous transmissions among different users by using different channels, (e.g., different frequency bands) and time division multiplexing is employed by AF cooperative diversity for each user. One possible implementation for our considered network model is as follows. The available bandwidth is equally divided into as many bands as the number of users. Each user is allocated one frequency band and communication between each source and destination pair via relay nodes is carried out in a time multiplexing manner , that is, each source transmits data to its chosen relays in the set in the first stage and each relay amplifies and forwards its received signal to in the second stage. Note that our approaches can still be used for other possible implementations as long as the assumption of orthogonal transmissions is satisfied. The system model under investigation is illustrated in Figure 1. Note that this model is quite general, and it covers a large number of applications in different network settings. For example, this model can be applied to cellular wireless networks which use relays for uplink with one destination base station (BS) or downlink with one source BS and many destinations. The model can also be directly applied to multihop wireless networks such as sensor/ad hoc or wireless mesh networks. Moreover, in our model, each source can be assisted by one, several, or all available relays. Therefore, it captures most relay models considered in literature. Note that we consider the case when the source-to-relay link is (much) better than the source-to-destination link, which is a typical outcome of a good relay selection by each source node. This is a practical assumption since source nodes are likely to use the closely located relays. The following lemma is in order. The rate function of user defined as (b/s/Hz) is a concave increasing function of . It can be seen that is a concave increasing function of . Furthermore, since the function is concave increasing, and using the composition rule , it can be concluded that is concave increasing as well, that is, by increasing the power allocated at the relays to user , its rate is increased. In addition, the maximum achievable rate is equal to . However, since is concave increasing, the incremental increase of rate w.r.t. is smaller for larger . The convexity and monotonicity properties of are extremely useful. While the former helps to exploit convex programming, the latter provides some insights into optimization problems under consideration as will be shown shortly. In general, resource allocation in wireless networks should take into account the fairness among users. It is known that an attempt to maximize the sum rate of all users can significantly degrade the performance of the worst user(s). To balance fairness and throughput performance for all users, we consider two different optimization criteria for developing power allocation algorithms. The first criterion aims at maximizing minimum rate among all users. In essence, this criterion tries to make rates of all users as equal as possible. For the second criterion, users are given different weights, and power allocation is performed to maximize the weighted-sum of rates for all users. In this case, large weights can be allocated to users in unfavorable condition in order to prevent severe degradation of their performance. Moreover, this objective also captures the scenarios in which one needs to perform QoS differentiation for users. Then, the users of higher service priority can be allocated larger weights. For both aforementioned optimization criteria, we add constraints on the total maximum power that each relay can use to assist the corresponding users. where is the maximum power available in relay . The left-hand side of (6b) is the total power that relay allocates to its assisted users which is constrained to be less than its maximum power budget. Instead of constraining the transmit power for a particular relay as in (6b), we can equivalently limit the sum of power transmitted by its relayed source nodes, or limit its received sum of power. This constraint is required to avoid overloading relays in the network. The objective function (7a) is linear, and thus, convex. The constraints (7b) are convex due to Lemma 1, while the constraints (7c) are linear, and thus, also convex. Therefore, the optimization problem (7a)–(7c) is convex. Moreover, at least one of the constraints (7b) must be met with equality at optimality. Otherwise, can be increased, or equivalently, can be decreased, and thus, contradicting the optimality assumption. The convexity of the formulated power allocation problem is very useful to obtain its optimal solution by using any standard convex optimization algorithm such as interior-point algorithms . In the special case when all users share the same set of relays, we have the following result. Consider a special case when all users have the same set of relays (e.g., users are assisted by all relays). Then the rates of all users are equal at optimality. Suppose that there is at least one user achieving the rate strictly larger than the minimum rate at optimality. Without loss of generality, let be the set of users achieving minimum rate and suppose that user has rate larger than that of any user at optimality. Note that there exists at least one relay which has nonzero allocated power at optimality. If we take an arbitrarily small amount of power from and allocate an amount of power equal to to each user where denotes the cardinality of set , then the resulting rate of user is still larger than the minimum rate of all users while we can improve the minimum rates for all users in . This is a contradiction to the optimality condition. Hence, the proposition is proved. In general, users of higher priority are given larger weights. Specifically, all users can be grouped into different classes and users in the same class are assigned same weight. It can be seen that the constraints (8b) must be met with equality at optimality. Otherwise, the allocated powers can be increased to improve the objective value, that contradicts the optimality assumption. In addition, it can be verified that the optimization problem (8a) and (8b) is convex; therefore, its optimal solution can be obtained by any standard convex optimization algorithm. We conclude this section by noting that power allocation schemes based on other possible fairness criteria can also be considered. For instance, the proportional fairness criterion can be adopted. In terms of system-wide performance metric such as the network throughput, this criterion can ensure more fairness than the weighted-sum of rates, while achieving better performance than the max-min fairness in term of the network throughput . It can be shown that the objective function to be maximized for the proportional fairness-based power allocation scheme is . Consequently, this objective function can be reformulated as a convex function using the function. Due to space limitation, investigation of this scheme is not presented in this paper. To relax the need for centralized channel estimation and to implement online power allocation for multiuser relay networks, we propose a distributed algorithm for solving the problem (8a) and (8b). The distributed algorithm is developed based on the dual decomposition approach in convex optimization (see, e.g., [16, 17] and references therein). An application of this optimization technique for distributed routing can be also found in . The distributed power allocation algorithm is developed by iteratively and sequentially solving the problems (14a) and (14b) and (15a) and (15b). This algorithm is known as a primal-dual algorithm in optimization theory . The Lagrange multiplier represents the pricing coefficient for each unit power at relay . Therefore, can be seen as the price which user must pay for using power at each relay . Then, the optimization problem (14a) and (14b) as a whole can be seen as an attempt of user to maximize its rate minus the total price that it has to pay given the price coefficients at relays. Moreover, the weight can be seen as a "gain" coefficient for each unit rate for user . The master dual problem is solved in a distributed fashion with assistance of all relay. Specifically, each relay first broadcasts its initial "price" value, that is, Lagrange multipliers . These price values are used by the receivers to compute the optimal power levels that the relays should allocate to that particular user. The optimal power values are then sent back to the relays, so as to yield the next value of the Lagrange multipliers . This procedure is repeated until the solution converges to the optimal one. which is unique due to the strict concavity. where is the iteration index, is the sufficiently small positive step size, and denotes the projection onto the feasible set of nonnegative numbers. The dual variables will converge to the dual optimal as , and the primal variable will also converge to the primal optimal variable . Updating based on (17) can be interpreted as the relay updates its price depending on the requested levels from its users. The price is increased when the total requested power resource from users is larger than its maximum limit. Otherwise, the price is decreased. This so-called "price-based" allocation is very popular in wired networks to control congestion, that is, rate control for Internet . We summarize the distributed power allocation algorithm as follows. Parameters: The receiver of each user estimates/collects its weighted coefficient and channel gains of its transmitter-relay and relay-receiver links. Initialization: Set and initialize for each relay equal to some nonnegative value and broadcast this value. Step 1. The receiver of user solves its problem (16) and then sends the solution to its relays. Step 2. Each relay receives the requested power levels and updates its prices with the gradient iteration (17) using the information received from the receivers of its assisted users. Then, it broadcasts the new value . Step 3. Set and go to Step 1 until satisfying the stopping criterion. The convergence proof of the general primal-dual algorithm can be found in [16, 17]. This algorithm requires message exchange only between relays and their assisted receivers. These message exchanges are performed using single-hop communications. Therefore, the total overhead would be the overhead involved in one message exchange operation multiplied by the number of iterations. Moreover, after optimal solution is first reached, the algorithm needs very few iterations to reach its new optimal solution which can be changed due to small changes in channel gains and users's partnership (i.e., a set of relays which help each user may slightly change due to users' mobility). In contrast, a centralized algorithm would require the full knowledge of all channel gains, relay power limits, and users' partnership information at a central controller before calculating an optimal solution which is then forwarded to each user for implementation. These information exchanges need to be performed over multihop transmissions, and it has to be done frequently due to frequent changes in wireless channel and system parameters. Considering these factors, our proposed distributed algorithm is clearly significantly better than the centralized algorithm in terms of the data overhead. The stopping criterion for the proposed algorithm is that the difference of congestion prices and/or allocated relay power in two consecutive iteration must be smaller than a predetermined value (e.g., ). As noticed before, if users have minimum rate requirements, an admission control mechanism should be employed to determine which users to be admitted into the network due to limited power resources at relays. Then, radio resources are allocated to admitted users in order to ensure that each admitted user achieves the required QoS performance. This scenario is important for real-time/multimedia applications. where denotes the minimum rate requirement for user . There are instances in which the optimization problem (18a)–(18c) becomes infeasible. A practical implication of the infeasibility is that it is impossible to serve all users at their desired QoS requirements. In QoS-supported systems, some users can be dropped or the rate targets can be relaxed as a consequence. We investigate the former scenario and try to maximize the number of users that can be admitted at their minimum rate requirements. The joint admission control and power allocation problem can be mathematically posed as a two-stage optimization problem . All possible sets of admitted users with possibly maximal cardinality (can be only one or several sets) are found in the first admission control stage, while the optimal set of admitted users is the one among the sets which requires minimum transmit power in the second power allocation stage. Once the candidate sets of admitted users are determined, the power allocation problem can be shown to be a convex programming problem. However, the admission control problem is combinatorially hard, which introduces high complexity for practical implementation. Therefore, a low-complexity solution approach for the joint admission control and power allocation problem is highly desirable. where denotes the indicator function for user , that is, corresponds to the situation when user is not admitted, while means that user is admitted. Note that the constraint (19b) is automatically satisfied for the users who are not admitted. The indicator variables help to represent the admission control problem in a more compact form. However, the combinatorial nature of the admission control problem still remains due to the binary variables . The problem (20a) and (20b) is a compact mathematical formulation of the joint optimal admission control and power allocation problem. Moreover, it is always feasible since in the worst case no users are admitted, that is, . Although the original optimization problem (20a) and (20b) is NP-hard, its relaxation for which are allowed to be continuous can be shown to be a convex programming problem by using Lemma 1. In the following subsection, we propose a reduced-complexity heuristic algorithm to perform joint admission control and power allocation. Albeit theoretically suboptimal, the heuristic algorithm performance very close to the optimal solution for most testing instances summarized in the next section. The following heuristic algorithm, which has some similarities to the one in , can be used to solve (20a) and (20b). Step 2. Solve convex problem (20a) and (20b) for the sources in with being relaxed to be continuous in the interval . Denote the resulting power allocation values as . from the set and go to Step 2. It can be seen that after each iteration, either the set of admitted users and the corresponding power allocation levels are determined or one user is removed from the list of most possibly admitted users. Since there are initial users, the complexity is bounded above by that of solving convex optimization problems with different dimensions, where the dimension of the problem depends on the iteration. It is worth mentioning that the proposed reduced-complexity algorithm always returns one solution. Consider a wireless relay network as shown in Figure 1 with ten users and three relays distributed in a two-dimensional region of a size . The relays are fixed at coordinates , and . The source and destination nodes are deployed randomly in the area inside the box areas and , respectively. In our simulation, each user is assisted by two relays. The noise power is taken to be equal to . All users and relays are assumed to have the same minimum rate and maximum transmit power . The unit for the power is Watt (W) in our simulation. To evaluate the efficiency of the proposed algorithm for the joint admission control and power allocation, the performance of the optimal algorithm by searching all possible user combinations is used as a benchmark. We also adopt a convenient and informative way proposed in  to represent the results. The CVX software package  is used for solving convex programs in our simulations. In this subsection, the locations of the source and destination nodes are fixed and the source nodes transmit power are chosen to be 1. The channel gain for each transmission link is affected by the path loss and Rayleigh fading. The pass loss component is where is the Euclidean distance between two transmission ends, while the variance of the Rayleigh fading equals to 1 in our simulations. Instantaneous channel fading gains are assumed to be known and not varied during the time required to compute the solutions, that is, it is assumed that the algorithms can provide their solutions faster than the time variation of the channel fading. The results are averaged over 800 channel instances. 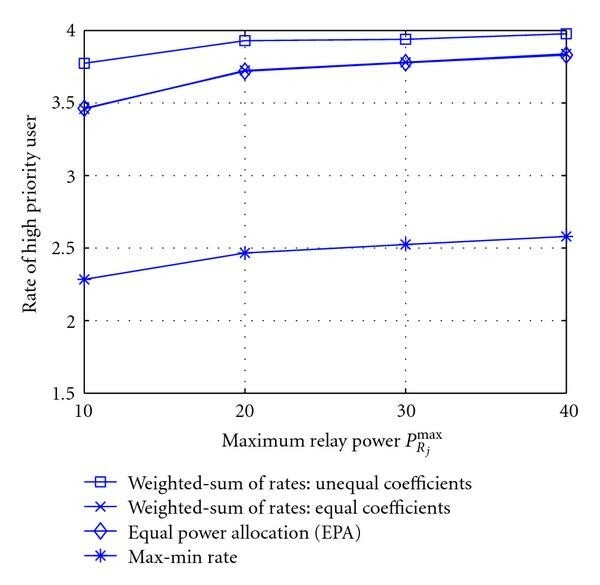 Figure 2 shows the data rate of the worst user(s) versus relay maximum transmit power for the proposed allocation schemes: max-min rate fairness and weighted-sum of rates fairness with equal weight coefficients. The equal power allocation (EPA) scheme in which each relay distributes power equally among all relayed sources is included as reference. It can be observed that the worst user obtains the best rate under the max-min fairness scheme and the worst rate under the weighted-sum fairness scheme with equal weight coefficients. Over the wide range of maximum relay power, the best rate offered by the max-min fairness scheme has much smaller variation (about 0.12 b/s/Hz) than the worst rate achieved by the weighted-sum of rates scheme (with variation of about 0.35 b/s/Hz). 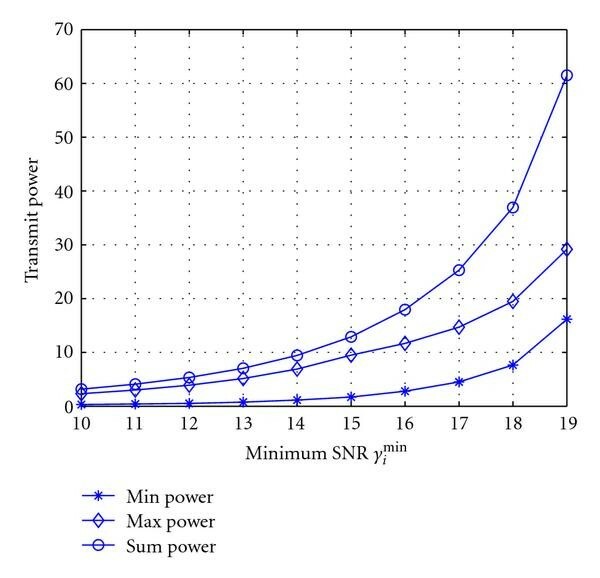 In other words, as expected, the weighted-sum of rates maximization based power allocation scheme can introduce unfairness in terms of the achievable rate of the worst user, especially when relays have low-power limits. Moreover, it can be seen that with large power available at the relays, that is, larger , all three schemes provide better performance for the worst users, and thus, for all users. Worst user rate versus . In our second example, we show that by proper weight setting, the weighted-sum of rates maximization based power allocation scheme provides the flexibility required to support users with differentiated service requirements. Particularly, we suppose that users 1 and 2 have higher priority than other users, and set the corresponding weights as in the optimization problem (8a) and (8b). Figure 3 displays the resulting rate of the high-priority users. We observe that users 1 and 2 have indistinguishable performance, so only one curve for each scheme is plotted. The results obtained by EPA and by weighted-sum of rates maximization with equal weight coefficients are also plotted in the same figure for reference. Over the wide range of the relay power limits, the weighted-sum of rates maximization scheme outperforms the EPA. The performance of the EPA is quite close to that of the weighted-sum of rates maximization with equal weight coefficients. 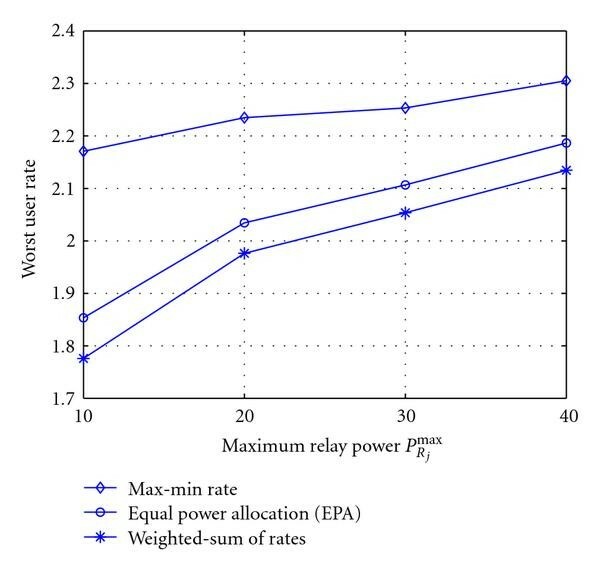 On the other hand, the weighted-sum of rates maximization with unequal weight coefficients provides noticeable rate enhancement to the high-priority users as compared to other users, especially when the relays have severe power limitation, for example, a rate gain of about 0.2 b/s/Hz when . Both Figures 2 and 3 indicate that the performance difference between different algorithms becomes smaller for larger relay power limits. In other words, this reveals an interesting property that when the relays have more (or unlimited) available power, different (relay) power allocation strategies have much less impact on the user rate performance, which is limited by the source transmit power in this case. Rate of high-priority users versus . Figure 4 shows the network throughput for the aforementioned power allocation schemes. It can be seen that there is a significant loss in the network throughput for the max-min rate fairness-based power allocation scheme, since the objective is to improve the performance of the worst users. This confirms that achieving the max-min fairness among users results in a performance loss for the whole system. It can be also seen that the weighted-sum of rates fairness-based scheme results in maximum throughput. Moreover, the rate gain of the weighted-sum of rates scheme over the EPA scheme is about 1.8 b/s/Hz over the range of the relay power limits. This gain comes at the cost of higher complexity in system implementation to optimize the power levels. The weighted-sum of rates based scheme with unequal weights achieves slightly worse performance as compared to its counterpart with equal weights while providing better performance for the high priority users, that is, users 1 and 2 in Figure 3. In the next example, we study the fairness behavior by showing the fairness index which is calculated as  for different power allocation schemes. Specifically, we plot the fairness index versus in Figure 5. The fairness index is closer to 1 when the power allocation, or equivalently rate allocation, becomes fairer. Clearly, the max-min fairness scheme achieves the best fairness for all the users, and the weight-sum of rates fairness scheme is least fair. It is implied from Figures 2, 3, 4, and 5 that our proposed approaches equip network operators with different design options each of which presents a different tradeoff between throughput and fairness for the users. Figures 6 and 7 show the evolution of different parameters of the proposed distributed algorithm for a specific channel realization. 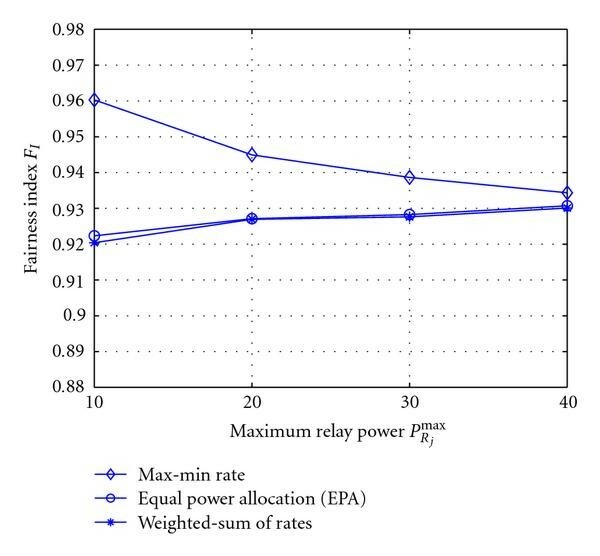 Particularly, Figure 6 shows the evolution of the price values and the power at each relay. Figure 7 displays the rates for all ten users and the sum rate of all users. The update parameter is set to 0.001. With such choice of parameter, we can see that after about 50 updates, the algorithm converges to the optimal solution obtained by solving the optimization problem centrally. Evolution of "price" values and power allocated at each relay. Evolution of data rate for each user and user sum rate. In this subsection, QoS requirements for users will be presented in minimum rate and/or the corresponding minimum SNR (there is one-to-one mapping between these two quantities). Figure 8 displays the power required at the relays for all users to achieve a minimum when . To obtain this figure, we solve the optimization problem (18a)–(18c) without the constraint (18c) and plot the optimal values of the objective function (18a), the minimum, and the maximum powers. It can be seen that to satisfy users with higher SNR requirements, that is, better QoS, more power is required. Moreover, Figure 8 shows that when admission control is needed in limited power systems. For example, when the total power available at the relays is constrained to be less than some value, let us say 30, we cannot meet the SNR target dB for all users. In such a case, admission control is necessary to drop some users. In this simulation example, we investigate the performance of the proposed joint admission control and power allocation algorithm with and different minimum SNR/rate requirements as shown in Tables 1 and 2 for . It is assumed that the channel gain is due to the path loss only and the locations of the source and destination nodes are fixed. Different values of have been used. For reference, we also consider the optimal admission control and power allocation scheme using exhaustive search over all feasible user subsets. A feasible user subset contains the maximum possible number of users and is selected as the optimum user subset if it requires the smallest transmit power. The simulation parameters and the performance results for the optimal admission control and power allocation scheme, and the proposed heuristic scheme are recorded in the columns "optimum allocation" and "proposed algorithm", respectively. Note that the running time is measured in seconds. It can be seen that the proposed algorithm determines exactly the optimal number of admitted users in all cases except when . The transmit power required by our proposed algorithm is just marginally larger than that required by the optimal admission control and power allocation based on exhaustive search. However, the running time for the proposed algorithm is dramatically smaller than that required by the optimal one. This makes the proposed approach attractive for practical implementation. As expected, when increases, a smaller number of users is admitted with a fixed amount of power. For example, when , nine users and four users are admitted with SNR dB and 14 dB, respectively. Similarly, when the relays have more available power, a larger number of users are likely to be admitted for a given threshold. For instance, when dB, eight and six users are admitted with and 10, respectively. Simulation cases and results with (running time in seconds). Simulation cases and results with . In the last example, we provide a comparative investigation on the performance of our proposed algorithm and the optimal algorithm. Due to a long running time required to obtain intensive results for the optimal algorithm based on the exhaustive search, only 20 different sets of data for each are tested. Each set of data has different locations for source and destination nodes which are generated randomly. All other parameters remain the same, for example, , and the SNR thresholds . The results are shown in Table 3 in terms of the following comparison metrics: (INFO 1) is the number of simulation runs in which the proposed algorithm provides different number of admitted users as compared to the optimum allocation using exhaustive search; (INFO 2) is the number of simulation runs in which the algorithms provide the same number of admitted users as the optimum algorithm; (INFO 3) is the number of cases in which both algorithms provide the same set of admitted users; (INFO 4) and (INFO 5) show, respectively, the average increase percentage in the required power and the average improvement ratio in running time offered by the proposed algorithm as compared to the optimum allocation using exhaustive search. We can see that the proposed algorithm performs remarkably well with dramatically smaller running time as compared to the optimal algorithm, while the performance loss in the required power is acceptable. Performance comparison with (20 runs). In this paper, two power allocation schemes have been proposed for wireless multiuser relay networks based on amplify-and-forward cooperative diversity to maximize either the minimum rate among all users or the weighted-sum of rates. The proposed approaches make use of a computationally efficient convex programing. The distributed algorithm for the weighted-sum of rates maximization based power allocation has been also developed by using the dual decomposition approach. 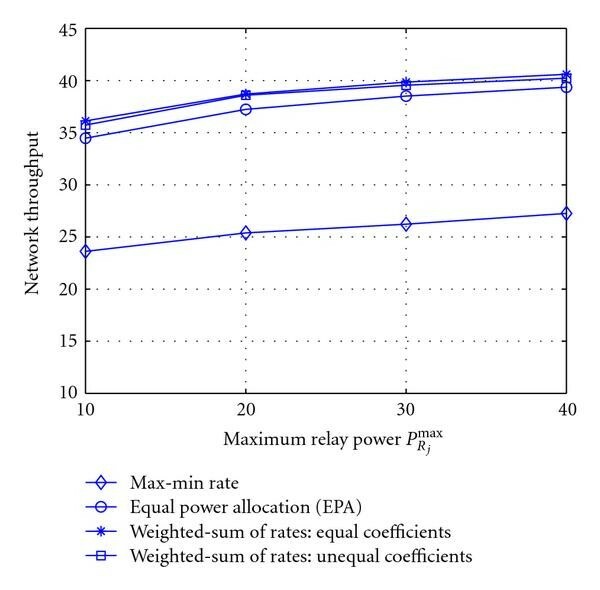 Numerical results demonstrate the effectiveness of the proposed methods and reveal interesting tradeoff between throughput and fairness for different power allocation schemes. Moreover, the joint admission control and power control algorithm for the scenario in which users have minimum rate requirements which aims at minimizing total relay power has been developed. Because the underlying problem is nonconvex and combinatorially hard, the suboptimal algorithm which achieves excellent admission control performance while requiring moderate computational cost is proposed. However, whether distributed joint admission control and power allocation is possible remains an interesting open research problem. The first author is grateful to D. S. Michalopoulos from the Aristotle University of Thessaloniki, Greece for discussions on the subject. This work was supported by the Natural Sciences and Engineering Research Council (NSERC) of Canada, and the Alberta Ingenuity Foundation, AB, Canada.